Distillers and alcohol producers have a common need: packaging their alcohol and spirits bottles with a perfect design, reflecting their brand image. Whatever the form or format, CDA offers to distilleries a labelling machine or a packaging solution adapted. Small productions of Cointreau, Gin, Calvados, Tequila, liqueur bottles, will turn towards a semi-automatic labeller purchase for a speed optimization. Every format (20cL, 70cL, 75cL, 1.5L, miniature, Jéroboam, Magnum, Methuselah, flasks, …) and every shape (square, ovale, rectangular, conical bottles) will find their labelling partner. When the production is getting more important and the needed speed is high, an automatic labeller is required. Within the CDA automatic labelling machines range, the decision is taken depending on the bottles form (conical, square, oval …). In our range, you will find automatic labelling machines adapted to every form and format. 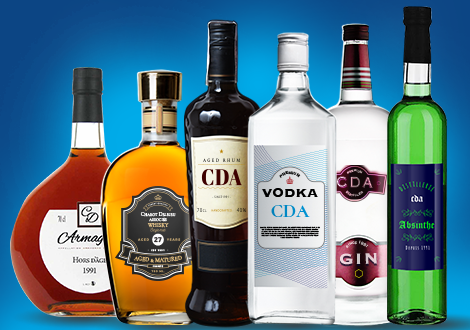 Beyond the labelling and packaging of your bottles, CDA offers a complementary solutions range to complete your packing lines for spirits bottles. Conveyor, screw capping, marking, … Ask advice to our team. The range of distilleries products is large: bottles of different formats (miniature, flask, demie, Magnum, Jéroboam, Methuselah, Balthazar, …), of different shapes (square, oval, rectangular, conical, cylindrical, …) for different alcohols and spirits (rum, whisky, bourbon, armagnac, cognac, brandy, vodka, absinthe, chartreuse, cointreau, calvados, gin, tequila, liqueurs, …). As the alcohols and spirits offer is growing, the labelling becomes a major challenge of differentiation for distillers. Special labels in tin, transparents, mirror-printed … Given the legal mentions, the special techniques, more and more original labels, and the need of perfection, the labelling of spirits bottles is crucial to stand out of the crowd in full alcoholic drinks departments. In order to meet that need of originality and especially of precision, CDA provides the spirits bottles producers with a large range of labelling machines, combining versatility and precision. Application of one or more labels, machines adapted to various formats and shapes … the CDA automatic or semi-automatic labelling machine that you will chose is the best partner for the packaging of your spirits bottles. Find the machine made for your alcohols and spirits thanks to our experts. The micro-distilleries producing small volumes of spirits will look for a compact labelling machine, in order to minimise the congestion, often a problem in small spaces. But it will also generate an optimisation of the labelling speed. A CDA semi-automatic labeller will be the solution. With production volumes more important to be packaged, a craft distillery will be looking for an automatic labelling machine that guarantees high speed and less human intervention. Our range of automatic labellers will allow an accurate and fast labelling of medium and large productions. Distilleries more industrialized often have existing lines to which it is possible to integrate CDA packaging solutions. Our evolving machines are easily adaptable to existing lines. A CDA automatic labelling machine can be added to a complete line or can be used as a backup machine.